299 Berkeley is located on the SE corner of Marlborough and Berkeley, with 301 Berkeley to the north, across Marlborough, 25-27 Commonwealth to the south, across Alley 422, 30 Marlborough to the east, and First Church Boston to the west, across Berkeley. 299 Berkeley (34 Marlborough), the First Lutheran Church of Boston, was designed by architect Pietro Belluschi and built in 1956-1957. Groundbreaking ceremonies were held on May 13, 1956, and the church was completed in October of 1957. The church previously had been located on West Newton near Tremont in the South End. 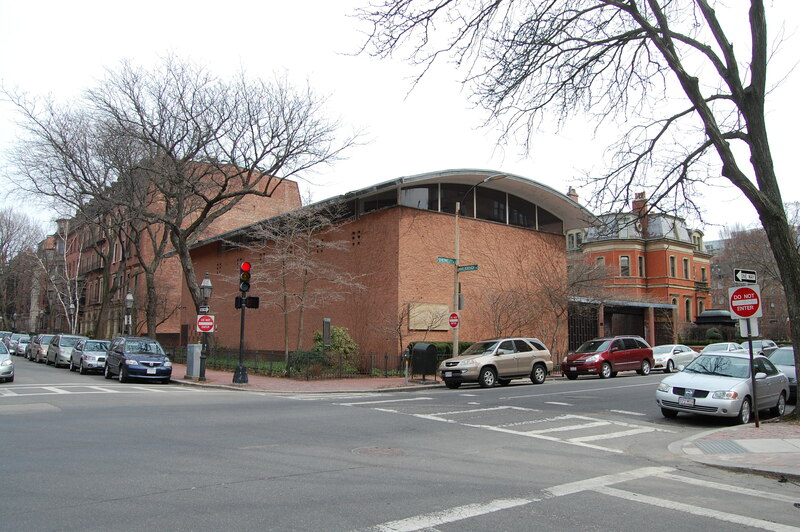 The Church was built on two lots: the corner lot at 299 Berkeley (with an 88 foot 6 inch frontage on Marlborough), which it acquired from the Massachusetts General Hospital on September 15, 1954, and the lot at 32-34 Marlborough to the east (with a 51 foot 6 inch frontage), which it acquired on December 15, 1954, from the estate of Elizabeth Cheney Kaufmann. Both lots were vacant. The house at 299 Berkeley had been razed in 1941, and the house at 32 Marlborough had been razed in 1953. The lot at 34 Marlborough had never been built upon. Click here for an index to the deeds for 299 Berkeley. In July of 1988, the First Lutheran Church applied for (and subsequently received) permission to subdivide 32-34 Marlborough from the remainder of their property at 299 Berkeley. In November of 1988, Wharf Development Corporation, the Church’s agent, applied to construct a seven-story building on most of this lot. As proposed, the building was to include nine dwelling units on floors two through seven, classrooms for the church on the first floor, and a 30 car garage at the basement level. The Board of Appeal approved the building on June 27, 1989, but it was never built. 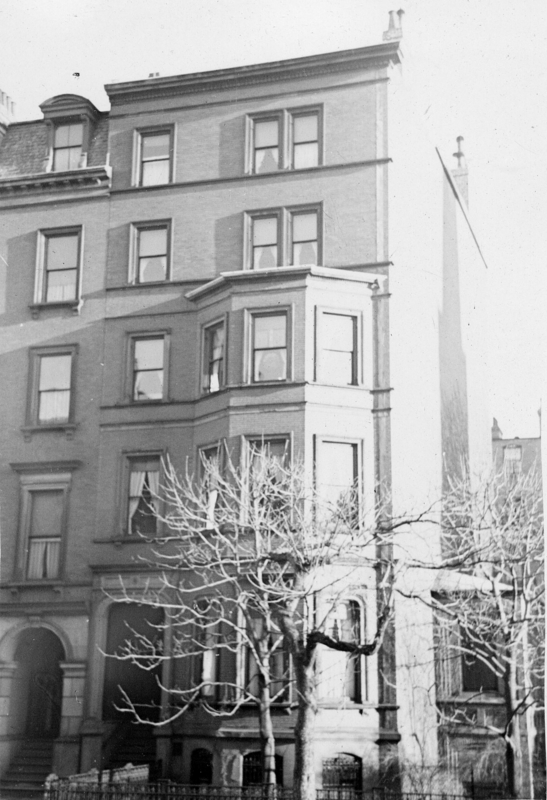 The original townhouse at 299 Berkeley was begun in 1870 but was not completed until 1877-1878. The original, partially completed house was designed by Arthur Gilman and the firm of Bryant and Rogers. The house ultimately built in 1877-1878 was designed by Peabody and Stearns. 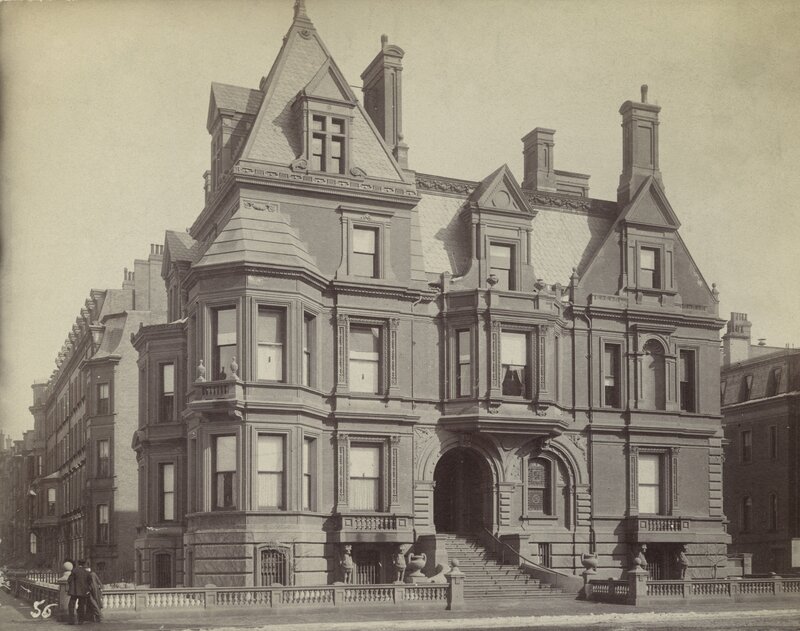 An August 27, 1870, article in the Boston Transcript comments on the house, then just beginning construction: “One of the largest and most ornate of the palatial residences which adorn the Back Bay territory is in process of construction for Mr. Josiah Caldwell, on a tract of land measuring upward of 120 feet square, bounding on Marlborough and Berkeley streets, and on a passageway. This structure is intended to be the most expensive of any of the recently-erected Renaissance edifices, and, though designed to be but two stories in height, will, including its basement story, stylobate and elevated chateau roof attain an altitude equal to most of the four-story houses in the vicinity. The designs for this structure are from the studio of Mr. Arthur Gilman of New York, and the superintendence of the construction in the hands of Messrs. Bryant & Rogers…”. 299 Berkeley (ca. 1880), photograph by Albert Levy; Ryerson and Burnham Archives, The Art Institute of Chicago (Digital file #51189). Josiah Caldwell and his wife, Anita (Smith) Caldwell, lived at 224 Beacon while their new home at 299 Berkeley was being built. A former clothing merchant, Josiah Caldwell was an investor and stock promoter of coal mines and railroads. He was a principal promoter of the Little Rock and Fort Smith Railroad in the late 1860s and early 1870s. In March of 1871, a railroad strike by unpaid workers caused the Little Rock and Fort Smith Railroad to default on bonds it had sold in 1869. That default, probably coupled with other financial difficulties, prompted the Caldwells to leave Boston before 299 Berkeley was completed. By 1872, they were living on the San Ricardo sugar plantation in Cuba owned by Anita Caldwell’s father, Richard Dimock Smith, and it does not appear that they resumed residence in Boston. Anita Caldwell had purchased the land for 299 Berkeley on September 10, 1870, from shipping merchant and US Congressman Samuel Hooper. He and his wife, Anne (Sturgis) Hooper, lived at 27 Commonwealth, across the alley from where 299 Berkeley would be built. The original lot acquired by Anita Caldwell had a frontage of 113 feet 8 inches on Marlborough, but included a restriction limiting to 24 feet the height of any building built on a 20 foot wide strip of land running between 72 and 92 feet east of Berkeley. This restriction probably was intended to preserve light for Samuel Hooper’s home at 27 Commonwealth. Samuel Hooper had acquired the land in three transactions, one on November 1, 1862, when he bought the corner lot with an 87 foot frontage on Marlborough, and two more on March 15, 1863, when he bought the lot to the east with a 26 foot 8 inch frontage. All of the land originally was part of a larger parcel purchased on May 2, 1860, from the Commonwealth of Massachusetts by Caleb William Loring and Charles F. Choate, trustees for a real estate investment trust formed by them with Francis B. Hayes and Franklin Evans. Click here for an index to the deeds for 299 Berkeley (Demolished). On December 20, 1873, 299 Berkeley was sold at auction to Jonas Fitch, a building contractor. He and his wife, Catherine (Blodgett) Fitch, lived at 30 Commonwealth. The house at 299 Berkeley was only partially completed. The uncompleted house appears on the 1874 Hopkins map. Jonas Fitch held the property for the next four years and, after resolving the City of Boston’s claims for back taxes owed by the Caldwells, sold the property on July 16, 1877, to banker and textile manufacturer Benjamin Edward Bates. 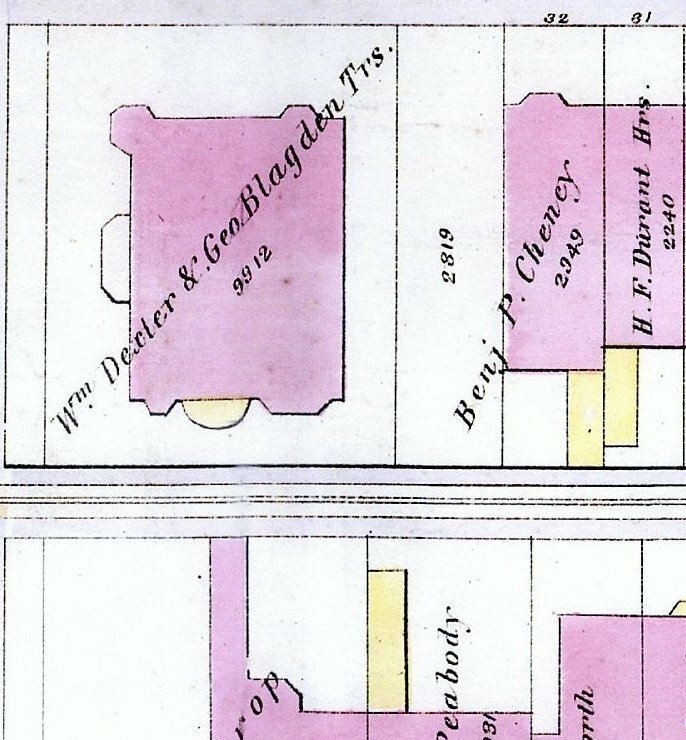 That same day, Benjamin Bates sold the western portion of the lot, with an 88 foot 6 inch frontage on Marlborough, to John Charles Phillips, Jr. Benjamin Bates retained the lot to the east at 34 Marlborough, with a 25 foot 2 inch frontage. 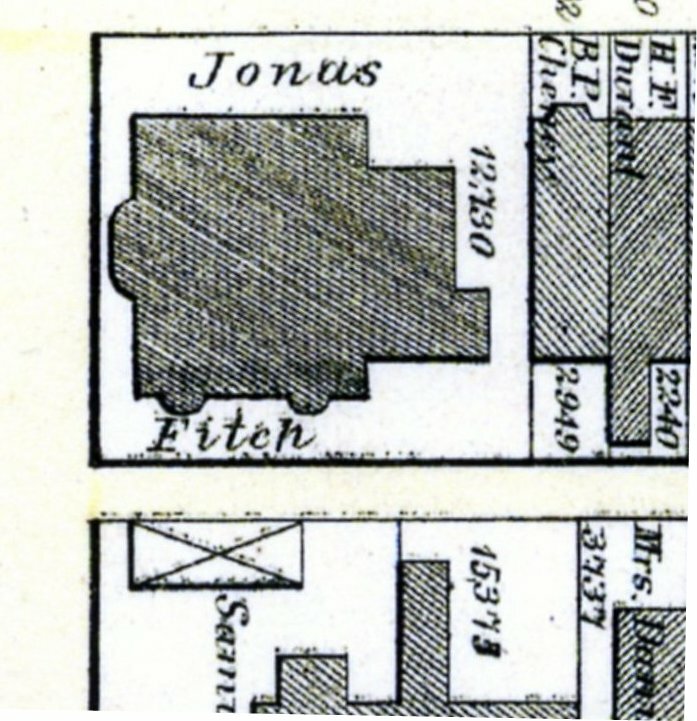 The unfinished building was located on both lots, and John Phillips was given the right to remove the materials on the lot retained by Benjamin Bates. John C. Phillips was an East India shipping merchant. He and his wife, Anna (Tucker) Phillips, lived at lived at 23 Commonwealth..
After acquiring the lot, John Phillips had a new home built at 299 Berkeley, designed by architects Peabody and Stearns. It is unclear the extent to which the new house incorporated portions of the Caldwells’ unfinished house. 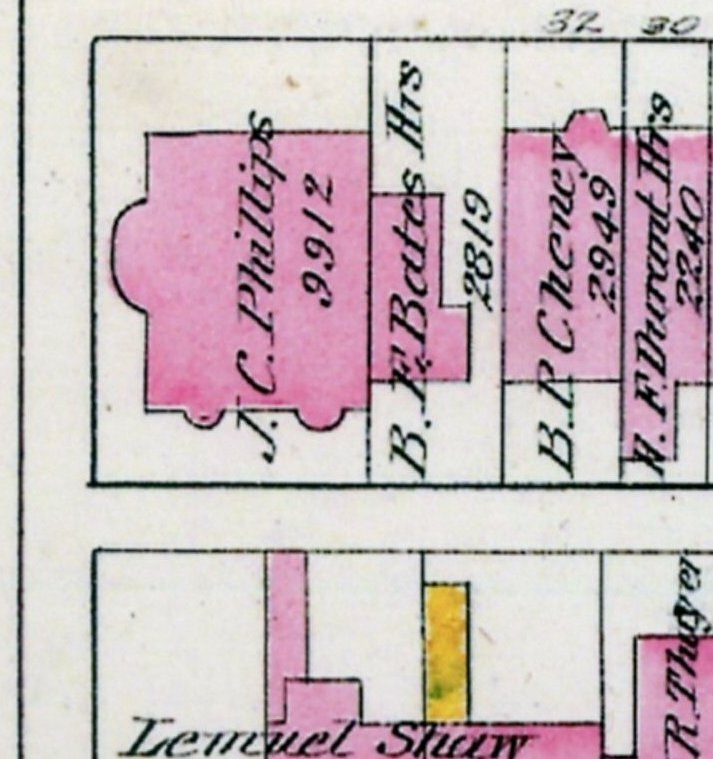 The 1883 Bromley map continues to show the portion of the earlier house that extended onto 34 Marlborough, indicating that this portion of the earlier structure remained. The 1888 map shows the new house in its final configuration. John Phillips died in March of 1885. Anna Phillips continued to live at 299 Berkeley until about 1910. 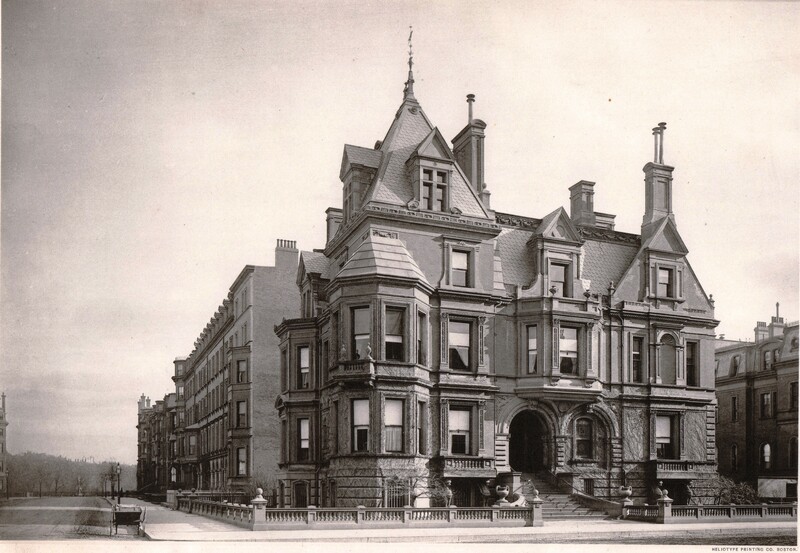 During the 1909-1910 winter season, she was joined at 299 Berkeley by Governor Eben Sumner Draper and his wife, Nannie (Bristow) Draper, while their home at 150 Beacon was being rebuilt following a major fire. On July 12, 1910, 299 Berkeley was acquired from the estate of John Phillips by real estate dealer James Sumner Draper. Although they shared the same surname and middle name, James Sumner Draper and Eben Sumner Draper were not closely related. 299 Berkeley was not listed in the 1911 Blue Book. On September 26, 1911, 299 Berkeley was acquired from J. Sumner Draper by retired banker and broker Frederic Bayard Winthrop. He and his wife, Sarah Barroll (Thayer) Winthrop, made it their home. They had married in July of 1911. Prior to their marriage, he had lived at 280 Beacon with his children by his first marriage, to Dorothy (Amory) Winthrop, who had died in July of 1907. Frederic and Sarah Winthrop also maintained a home, Groton House, in Hamilton, and a farm in Allendale County, South Carolina. On December 20, 1911, Frederic Winthrop transferred the property into both of their names, and on November 6, 1912, he transferred his one-half interest to Robert Shaw Barlow, in trust for his wife. Frederic Winthrop died in May of 1932. Sarah Winthrop continued to live at 299 Berkeley until her death in August of 1938 in an automobile accident. 299 Berkeley was razed in February of 1941 and on November 29, 1941, the vacant land was sold by the Winthrop family to attorney Robert Frederick Herrick. He and his wife, Margaret Forbes (Perkins) Rice Herrick, lived at 25 Commonwealth and also owned 27 Commonwealth. Robert Herrick died in October of 1942 and, under the terms of his will, 299 Berkeley was inherited by the Massachusetts General Hospital. The hospital also inherited 25-27 Commonwealth. The land at 299 Berkeley remained vacant until it was acquired by the First Lutheran Church in September of 1954. The original townhouse at 32 Marlborough was built in 1863 for cotton merchant John Pickering Putnam and his wife, Harriet (Upham) Putnam. They previously had lived at 62 Mt. Vernon. They also maintained a home in North Andover. The land for 32 Marlborough was purchased on January 17, 1863, by Nathaniel D. Hubbard, trustee for the benefit of Harriet Putnam, from Caleb William Loring and Charles F. Choate, trustees for a real estate investment trust formed by them with Francis B. Hayes and Franklin Evans. The lot was part of a larger tract of land with a 287 foot frontage extending east from Berkeley Street that the trust had purchased from the Commonwealth of Massachusetts on May 2, 1860. Click here for an index to the deeds for 32 Marlborough (Demolished)). Harriet Putnam also owned a lot across the street, at 17 Marlborough, which she sold to merchant George Dudley Howe in March of 1864. George Howe and his wife, Alice Lloyd (Greenwood) Howe, lived at 32 Marlborough while their house at 17 Marlborough was being built. They previously had lived at 17 Temple Place. The Putnams lived in North Andover and then traveled to Europe, where their daughter, Mary Upham Putnam, married in July of 1866 in Paris to Charles Frederick Fearing. J. Pickering Putnam died in January of 1867 in Switzerland, and by 1868, Harriet Putnam had made her Boston home at 78 Marlborough. On February 23, 1865, 32 Marlborough was purchased from Harriet Putnam’s trustee by Benjamin Pierce Cheney. He and his wife, Elizabeth Stickney (Clapp) Cheney, made it their home. They previously had lived at 12 Bowdoin. They also maintained a home in Dover, Massachusetts. Benjamin Cheney was founder of the United States & Canada Express Company, which provided express services throughout New England and later merged with American Express. 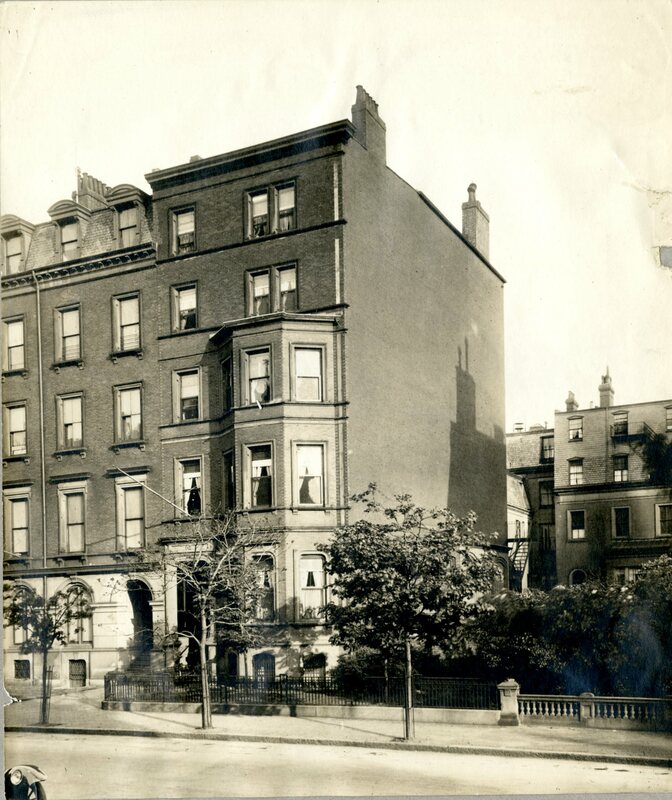 When the original lot for 32 Marlborough was purchased by Harriet Putnam’s trustee, it had a frontage of 27 feet. 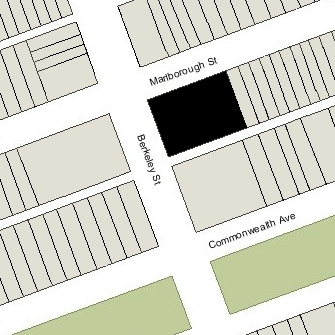 She had also purchased the lot to the west at 34 Marlborough, with a frontage of 26 feet, which was left vacant. When her trustee sold 32 Marlborough to Benjamin Cheney, the frontage was 26 feet 4 inches. On March 15, 1865, her trustee sold the remaining 8 inches of the lot at 32 Marlborough plus the vacant lot at 34 Marlborough to Samuel Hooper. He combined them with a third parcel at 299 Berkeley, with an 87 foot frontage he purchased on November 1, 1862, and then sold the combined lot with a 113 foot 8 inch frontage to Josiah Caldwell. This lot subsequently was acquired by Jonas Fitch in 1873 and then by Benjamin Edward Bates in 1877. Benjamin Bates was a banker and textile manufacturer. He developed water power and manufacturing in Lewiston, Maine, where he also founded Bates College. He and his wife, Sarah Chapman (Gilbert) Bates lived at 19 Arlington and in Watertown. On July 16, 1877, Benjamin Bates sold 299 Berkeley, with a frontage on Marlborough of 88 feet 6 inches, to John C. Phillips. Benjamin Bates retained the remaining vacant lot to the east, at 34 Marlborough, with a frontage of 25 feet 2 inches. Benjamin Bates died in January of 1878 and Sarah Bates died in November of 1882. On May 19, 1883, Benjamin Cheney purchased the vacant lot at 34 Marlborough from the the estate of Benjamin Bates. The lot and 32 Marlborough remained under the same ownership thereafter. Benjamin Cheney died in July of 1895. Elizabeth (Clapp) Cheney continued to live at 32 Marlborough, and to maintain her home in Dover and at another home, The Needles, in Peterborough, New Hampshire. On October 13, 1904, Benjamin Cheney’s estate transferred 32-34 Marlborough to her, and on December 9, 1904, she transferred an undivided half interest to their daughter, Elizabeth. Elizabeth Cheney, the daughter of Benjamin and Elizabeth (Clapp) Cheney, married in December of 1911 to Carl Frederick Kaufmann; after their marriage, they lived at 32 Marlborough with her mother. Elizabeth (Clapp) Cheney died in December of 1922. Carl and Elizabeth (Cheney) Kaufmann continued to live at 32 Marlborough and to maintain their home in Peterborough. Carl Kaufmann died in April of 1939. Elizabeth Kaufmann continued to live at 32 Marlborough until her death in August of 1953. In her will, she specified that 32 Marlborough was to be torn down “no matter who may be living with me or sharing my home at the time of my death.” She left her home in Petersborough, New Hampshire, to the Monadnock Community Hospital of Petersborough. 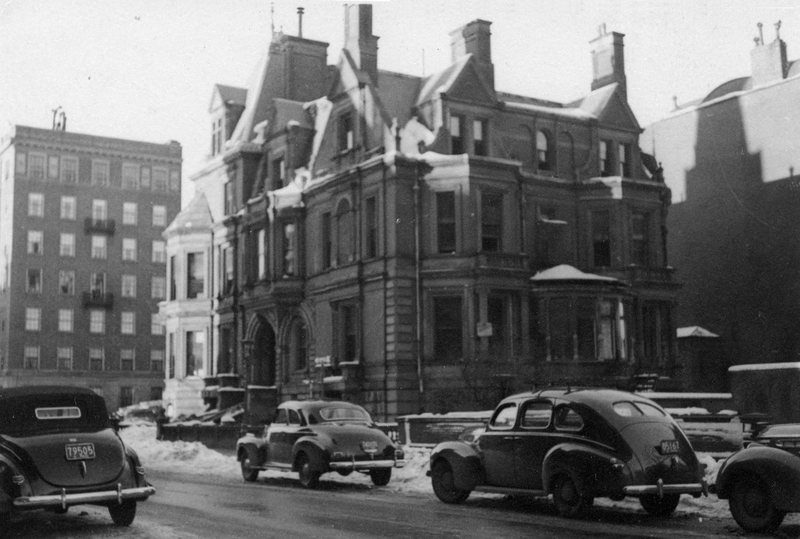 32 Marlborough was razed in December of 1953, and on December 15, 1954, the vacant land was sold by Elizabeth Kaufmann’s estate to the First Lutheran Church of Boston.